As Michel de Montaigne quite rightly observed, a book is the “brainchild” of its author. And we feel a great deal of affection for our children. Writers get this. But alas, many publishers do not. Books are, for them, little more than commodities. 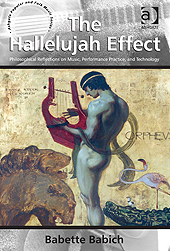 For instance, my friend Babette Babich’s book—The Hallelujah Effect: Philosophical Reflections on Music, Performance Practice, and Technology (2013)—has been, for quite some time now, held hostage by a shockingly stupid, shortsighted publisher. They know there’s a market for the book, and yet they refuse to bring it to market! You see the hardcover version was given an absurdly high price (CDN$ 163.44)—and that crazy high price has scared off all but the most well-heeled of the book’s would-be readers. Though numerous professors (myself included) have indicated that they’d very much like to assign a reasonably priced soft-cover version of this book to their classes, the publisher refuses to put out a paperback version of the book in question until every last one of those ridiculously expensive hard-backs is sold. I spoke to a representative from this mindbogglingly idiotic publishing company earlier on today. She seemed genuinely perplexed when I accused her of kidnapping. When I said she was holding my friend’s baby hostage. She really didn’t get it. Not even a bit. No joke: it was like trying to explain the color purple to someone who was born blind. p.s. Ashgate has caved somewhat since I wrote this. They’re now offering hardcover copies of The Hallelujah Effect for half price. But you have to buy it from their website, which is very inconvenient. And it’s still quite expensive. Regardless, as a result of this compromise, I’m willing to reconsider Ashgate’s grade. I’ll be submitting a Grade Change Form this afternoon. The “F” shall become a “D”. What’s more, I’ll be assigning the book to my classes in the Fall 2015 semester.